Sarah Nemtsov (née Reuter) was born in Oldenburg, Germany in 1980. Her mother was the painter Elisabeth Naomi Reuter. In 1987, Nemtsov got her first music lessons, around the same time she began writing her first compositions. 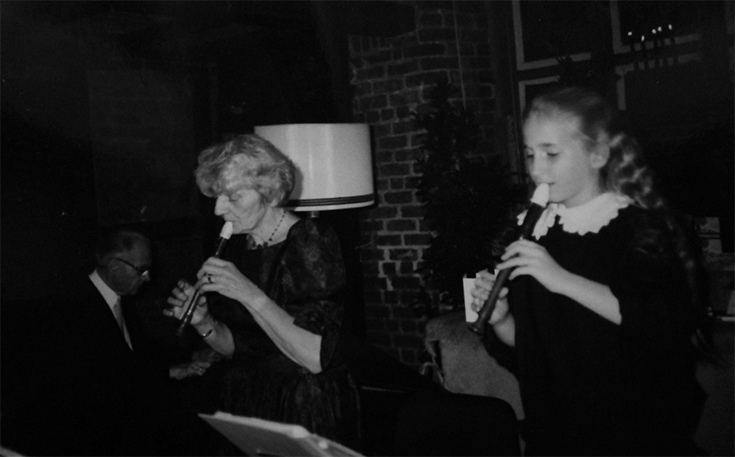 Between 1989 and 1993 she participated in numerous concerts and recordings of the REIL TRIO as a recorder player. At the age of 14 she started playing the oboe. Since 1998 she studied composition at the Hanover Hochschule for Music and Theatre with Nigel Osborne as a „young student“. In 2000 she began with her regular studies at the same institution with Johannes Schoellhorn (composition) and Klaus Becker (oboe). Since 2003 she studied oboe with Burkhard Glaetzner (Berlin). After her graduation in both disciplines in 2005, she began with her post-graduate studies in composition with Walter Zimmermann at the Berlin University of the Arts (Meisterschueler exam with distinction). Sarah Nemtsov is the recipient of several prizes and scholarships, such as the German Music Authors Prize (Deutsche Musikautorenpreis GEMA) in 2012, the Busoni Composition Prize (Academy of the Arts Berlin) in 2013, 2016 she won the international RicordiLAB composition competition, in 2018 she was awarded the Oldenburg Composition Prize for Contemporary Music. She got fellowships from various foundations, such as the German National Merit Foundation, Aribert Reimann Foundation, Berlin Senate, or Foundation Zurueckgeben, as well as a residence at Villa Serpentara (Italy) in 2011. 2014/2015 Sarah Nemtsov was composer in residence for Philharmonic Orchestra Erfurt (GMD Joana Mallwitz) and her orchestra pieces were featured in three symphonic concerts. In 2014 she was teaching (composition/music theatre) at the Musikhochschule Cologne. In 2018 (spring semester) she was teaching composition as a DAAD guest lecturer at the University of Haifa, Israel. Her chamber opera „Herzland“ (2005) premiered in Hanover in 2006; it was staged at the Bavarian state opera in 2011 (in co-production with Orchester Jakobsplatz Munich). Her opera „L’ABSENCE“ (2006-2008) after „Le Livre des Questions“ by Edmond Jabès had its premiere May 2012 at the Munich Biennale. Nemtsov’s music is played by renowned ensembles – such as Adapter, Neue Vocalsolisten Stuttgart, ensemble modern, ensemble recherche, ensemble mosaik, Ensemble InterContemporain, HR Symphony Orchestra, Basel Sinfonietta, Solistenstenensemble Kaleidoskop, Ensemblekollektiv Berlin, ensemble Lux:NM, Accroche Note, Trio accanto, Ensemble Garage, Ascolta, Vortex ensemble, PHACE, Sonar Quartet, Asasello Quartet, MIVOS Quartet, Nomos Quartet, SCENATET, Phace, Trio Arbós, Neopercusión, Black page orchestra, Oh-Ton-Ensemble, or the Finnish Baroque Orchestra. She has worked with conductors such as Joana Mallwitz, Baldur Brönnimann, Michael Wendeberg, Jonathan Stockhammer, Franck Ollu, Evan Christ, Manuel Nawri or Ilan Volkov. Her compositions are featured in various international festivals – for example at the Donaueschingen Music Days (2011 and 2018), Darmstadt Summer Course (2014 and 2018), Munich biennale (2012), ICSM World New Music Festival, Musica in Strasbourg, ECLAT Stuttgart, Bregenzer Festspiele, Holland Festival, Festival Ultraschall, MaerzMusik and Klangwerkstatt in Berlin, SPOR or Klang (Denmark), Musica Nova (Finland), Wien modern, Acht Brücken Cologne, Israel Festival or Klangspuren Schwaz. Several of her works are being published at Peer Music Classical Hamburg and since 2016 at Ricordi Publishing house. Several of her compositions are released on CD, amongst others two portrait CDs („A LONG WAY AWAY“ 2012, Edition zeitgenössische Musik/Wergo and „amplified imagination“ 2018, Wergo). In 2015 Sarah Nemtsov founded a gallery and concert venue in Berlin together with her husband Jascha Nemtsov – „Raum für Kunst und Diskurs“. Also she initiated (as artistic director and composer) the project „Mekomot“ 2015-2016 – a concert tour with contemporary music and old jewish liturgical chants through abandoned synagogues in Germany and Poland. For Sarah Nemtsov, literature (Edmond Jabès, Jacques Derrida, Paul Celan, Walter Benjamin, Emily Dickinson, Virginia Woolf, W.G. Sebald, Mirko Bonné or Ron Winkler ) plays an important role as a source of inspiration; it serves her in terms of content as well as formally, in her compositional technique as a conceptual stimulation for her own constant innovation. Often in the combination and contrast of audio and visual moments, at the borders of music theater, she explores new forms of musical presence. Her most recent works are exploring simultaneous and chaotic forms, in search of an „urban sound in music“, a sensual complexity, also involving electronics (and her fascination for analog effects processors – as with her chamber music cycle „ZIMMER“ or „white wide eyes“). As an oboist Sarah Nemtsov won first prices at several national oboe competitions like „Jugend musiziert – Bundeswettbewerb“ in 1999 (wood wind quintet) and in 2000 (oboe solo). She got a prize of the Hanover artist society and in 2001 a „Price of Niedersachsen“ with the Accopiato Quintet. In 2007, she got a special prize for the interpretation of her own composition „Interludien“. Sarah Nemtsov has performed as a soloist and in chamber ensembles, amongst others together with her husband, the pianist Jascha Nemtsov. Since 2007 she is concentrating on composition only. With kindly permission by artist Elisabeth Naomi Reuter (1946-2017) several of her paintings were used for this website.